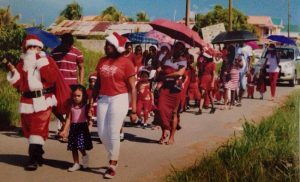 The students of Sherjoy Daycare, Playgroup and Nursery in collaboration with those of the Lomas Inc. ‘I am educated’ programme, on December 8 and December 15, last, explored the Avenues of the Diamond Housing Scheme dressed as Mr. and Mrs. Santa Claus. There were many tiny feet and joyous hearts, riding their imaginary reindeer, accompanied by Sherjoy Principal, Mrs. Maple Singh, along with parents and teachers. The event was the fourth annual Christmas Santa Parade. 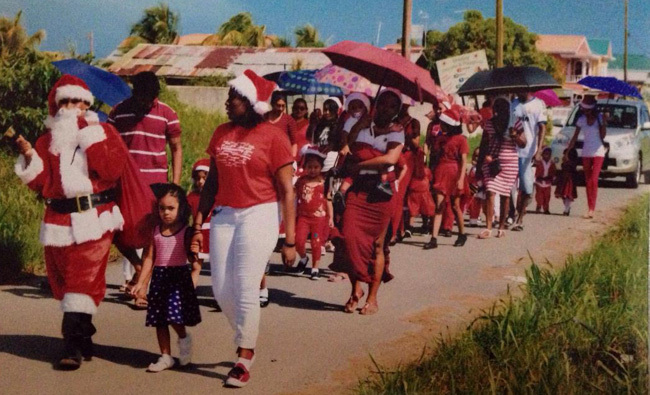 Remembering, “Tis the season to be jolly”, the parade proved to be the most marvelous of treats to the children of the community as the little Mr and Mrs Claus had an opportunity to share gifts to every child they met along the way. The organization was established by Pastor Mark Singh and his wife Mrs. Maple Singh. Focusing on educating those deemed slow in the Diamond community, it is considered the pioneer of the Sherjoy Daycare, Playgroup and Nursery School. Both entities are situated in 20th Avenue Diamond, New Scheme. The objective of both organisations is to end illiteracy in the community which was all encouraged and promoted by the late chief librarian Ms. Gillian Thompson, sister of Mrs. Maple Singh. The establishment of a small library was then made in her honour by Lomas Inc. The Sherjoy Daycare, Playgroup and Nursery School, which has been targeting an even younger generation of individuals, has also sought to aid in the foundational building blocks of the future.